This week the Adelaide Food Central team were lucky enough to attend a special lunch at Sushi Planet to celebrate the launch of their new menu. We were presented with an array of different Japanese dishes to sample, and it was a real treat to see the best of what Sushi Planet had to offer. With the restaurant being open for a couple of years now, it is a testament to them that they have kept up their standards to be one of the best, if not the best Sushi restaurant in Adelaide. We first tried a few starters to get our appetites going for the feast ahead of us. We had the Beef Tataki which is thinly sliced Beef with Spring Onion, Sesame Seeds and a Sesame Dressing, as well as Karrage or Japanese deep fried Chicken. 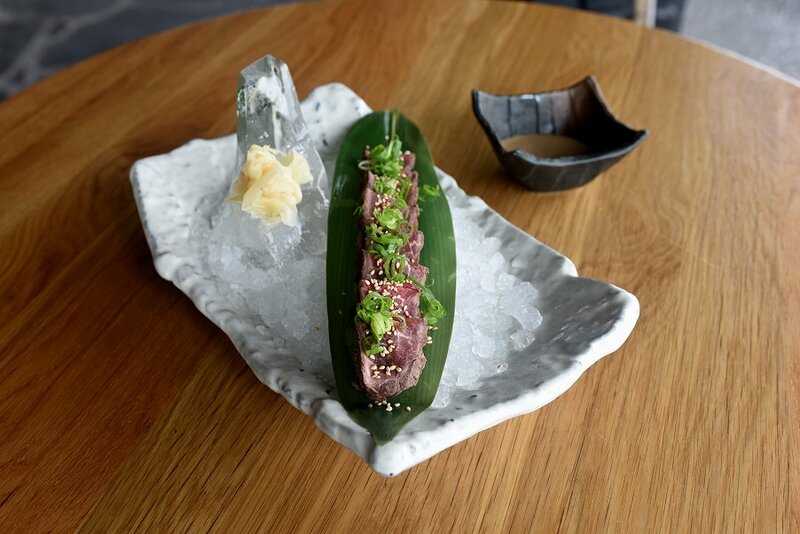 The Beef Tataki was served on a bed of ice to keep the dish fresh. The lightly seared Beef was amazingly tender and delicious accompanied with the Sesame Dressing. You also cannot go wrong with Karrage. The Chicken was perfectly cooked and moist, with a crispy coating. I had to stop myself from eating the whole plate as it was that mouth wateringly delicious. 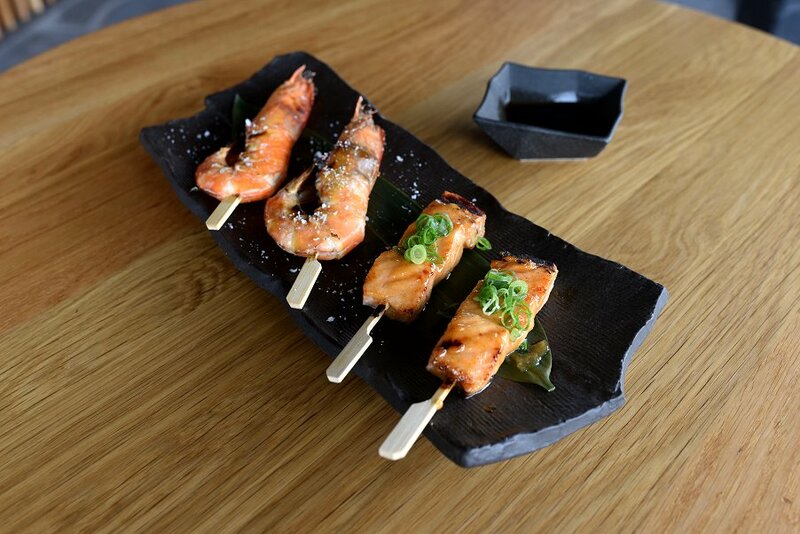 The selection of skewers were a highlight, including Jumbo Prawns served with Rock Salt and Ponzu Sauce as well as Breaded Pork, Chicken and Miso Salmon skewers. My favourite were the Miso Salmon Skewers. The Salmon was cooked to my liking and had a great Miso flavour throughout. You also cannot go wrong with a juicy Jumbo Prawn and Breaded Pork which is my personal go to. This is a great example of very simple food with few elements, executed well which is what makes Japanese food so delicious. Whenever I go out for Sushi I always opt for Inside Out or Topped Sushi Rolls as they are always so delicious, so I was in my element when presented with a huge selection of Sushi Planets Topped Sushi Rolls. This included a Shrimp Roll with Mango, Shrimp Roll with Avocado and Kingfish Roll which were all delicious. My favourite though was the Aburi Salmon Roll with Avocado, Snow Peas, and Cucumber with a Miso Aioli Sauce, topped with Seared Salmon, Unagi sauce, Sesame Seeds and Salmon Roe. 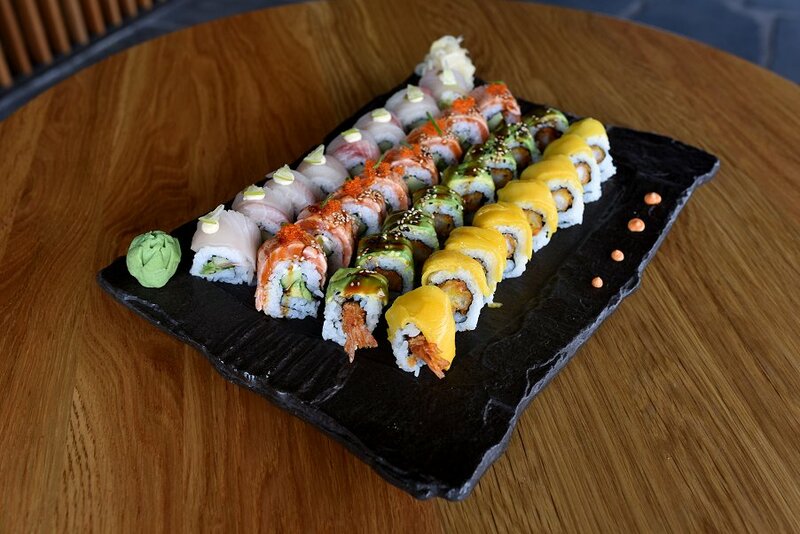 That sounds like a lot of components to a little Sushi Roll, but every flavour married well together to make the perfect mouthful. We also had the Sushi Planet Set which consisted of a selection of many of the foods we had sampled already in smaller dishes. 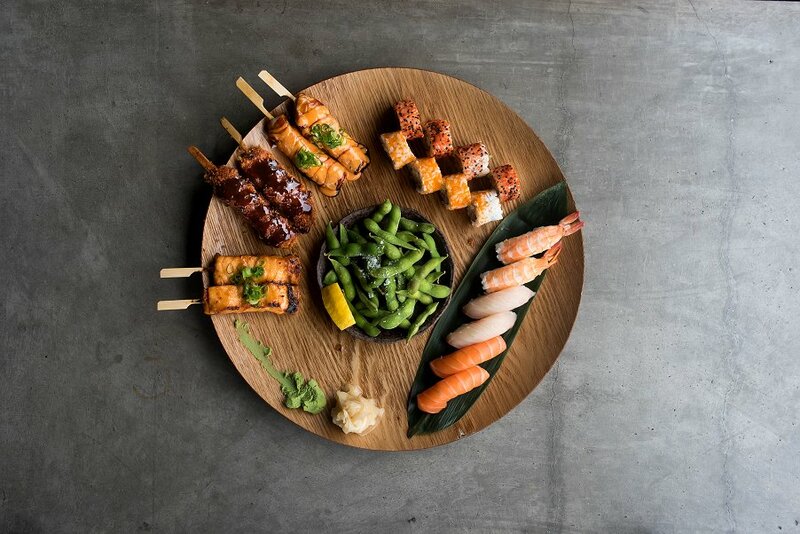 This large set included Salmon, Kingfish and Prawn Nigiri, Spicy Tuna Roll, Alaska Roll, Breaded Pork, Tender Chicken and Miso Salmon Skewers and Edamame Beans. This is a great set to order for sharing as it has a wide selection of different tasty dishes. I was also happy it included Edamame Beans as they are my weakness. 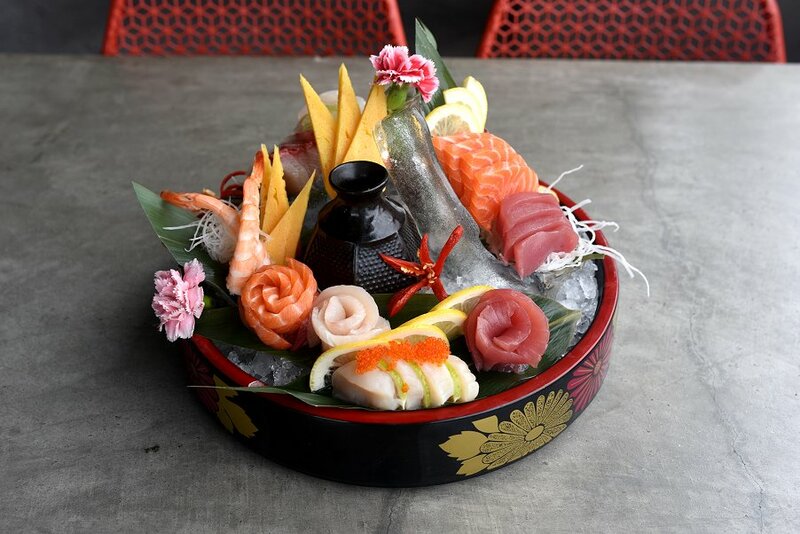 If all of this food wasn’t enough, we also were presented with the masterpiece that is the Super Sashimi Deluxe set. This was an assortment of Salmon, Tuna, Kingfish and Scallop Sashimi all freshly cut that morning. It tasted as fresh and beautiful as it looked and would also be great for sharing. I thoroughly enjoyed this lunch at Sushi Planet and will definitely be returning with friends one night. They have a great selection of dishes on the menu that would impress just about anyone, as they also have Vegan and Gluten Free options. Sushi Planet is a real winner and well worth the visit.